An expression orinated in American language use referring to oxidic solid impurities (scum, foam, slag) in the molten metal. 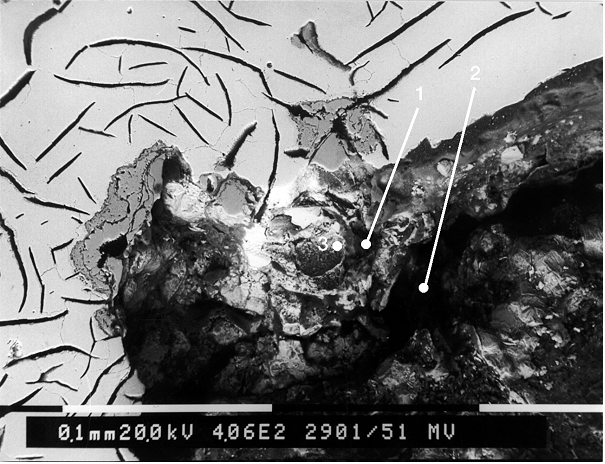 These so-named inclusions (e.g.. MgO-, MgS-, Mg-Al-silicate slags) occur in nodular graphite cast iron regardless of the molding prcess and are one of the most frequent defects present in this material (Figures 1 to 4). The endurance strength of a component is considerably reduced by dross-related defects. However, not the amount of dross is the decisive factor for formation of cracks but the presence of dross, in general. 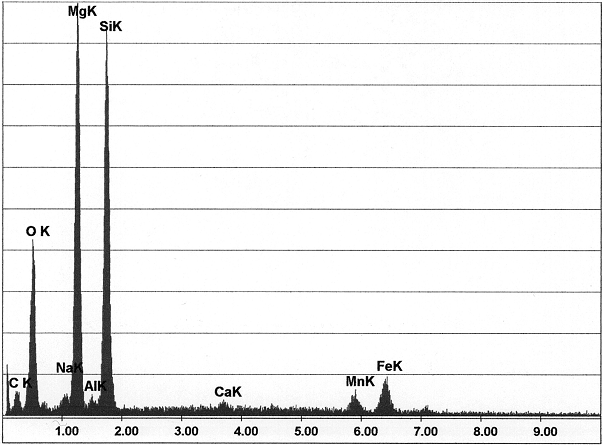 Figure 5 illustrates the temperature dependence of the free diffision enthalpies of some oxides, sulfides, oxisulfides, nitrides, and carbides in iron melts. From this image it can be seen that the magnesium oxide is significantly lower than the magnesium sufide, which is an indicator for the fact the magnesium oxide is more stable than magnesium sulfide. Continued desulfurization only takes place upon discharge of the oxygen content. In that condition, magnesium passes into solution and causes formation of nodular graphite. It is a fact that higher sulfur contents in the basic iron used for production of nodular graphite cast iron (e.g. cupola furnace iron) accordingly require greather addition of treatment agents (magnesium), i.e. the undesired reaction products, as stated above, are increased. The limit of error for formation of dross can be defined at a residual magnesium rate of 0.050 %. 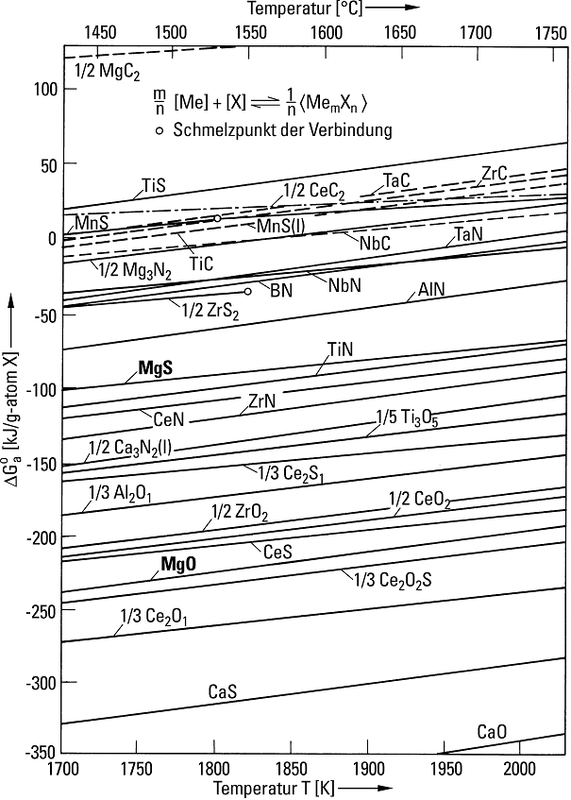 Other causes for formation of dross may also be factors such as incorrect initial composition of the basic iron (charge material with impurities, too high carbon content) and/or exceeded amounts of elements with great oxygen affinity, e.g. alkaline earth, aluminum, etc., incorrect temperature control or too low treatment temperatures caused by incorrect temperature control, exceeded casting periods in combination with too low casting temperatures, and mold sands with too high moisture contents and a low quantity of volatile components (insufficiently reducing atmosphere in the mold cavity). Giving a rest period for the treated iron to discharge reaction products. Dross occurs in the form of non-metal inclusions with irregular appearance with frequently degenerated nodular graphite in the ambience of dross (s. Graphite degeneration). Dross is mainly found on casting surfaces or directly underneath the casting skin, often accompanied by gas bubbles and scale. Due to their position and layout, these inclusions are sometimes referred to as slag skin. 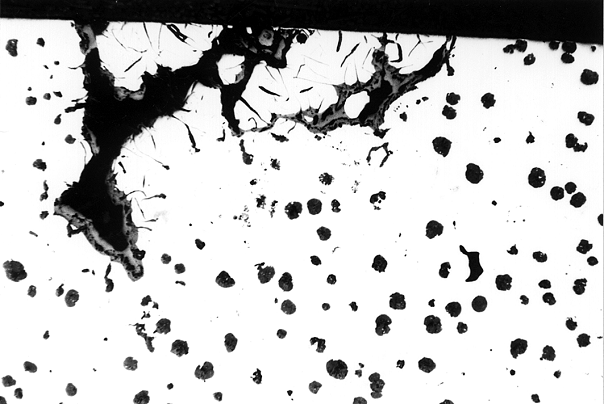 Undissolved inoculum residues as well as sand and slag inclusions in combination with graphite enrichment, visible in the fracture surface as black stains, are also classified as dross defects.